hosted by Viva Veltoro and Thrifty Nifty Mommy! Essentia is the world's only company that produces Natural Memory Foam mattresses. It all started when founder Jack had a family member stricken with cancer. He became aware of the toxins in everyday items and started searching for natural, healthier alternatives. Having been in the latex foam business for years, he started looking at mattresses and realized that most were made of poor quality components, filled with chemically derived foams that were treated with chemicals and layered together with glue. He developed a memory foam made from natural ingredients and founded Essentia - a company committed to comfort and quality, without compromise. 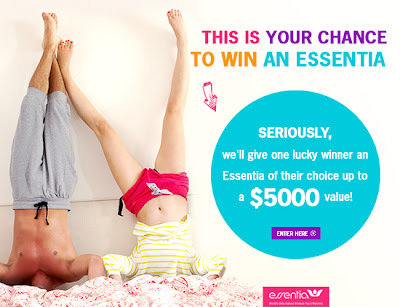 Essentia has an entire line of natural memory foam mattresses, organic sheets, pillows, dog beds, and crib mattresses. If you're familiar with Tempur-Pedic products, Essentia is comparable - only natural! Other memory foam products are manufactured from petroleum based chemicals, not Essentia. Essential products are made with your health in mind, starting with a foam that's hivea milk based, GREENGUARD certified glues and organic fabrics. Made entirely in Canada, Essentia products have been featured on Dr. OZ, Rachael Ray, and Anderson Cooper. The Baby Jeanius is made from organic denim and topped with our Natural Memory Foam for a comfortable and healthy sleep surface. Made with Essentia's Natural Memory Foam & organic denim. Columbia Labs Tested natural memory foam. No plastic, vinyl or chemically treated fabrics in this crib mattress. The Baby Jeanius is among the most natural and safest organic crib mattresses on the market. Meeting all government standards, this natural crib mattress passes all federal and state flammability standards using a Kevlar fabric, the same fabric found in bullet proof vests. The Baby Jeanius offers a firm yet comfortable nights sleep for your baby. The organic cotton support layer allows for healthy physical development, while our pressure relieving Natural Memory Foam lightly contours the body. Who needs a crib mattress? 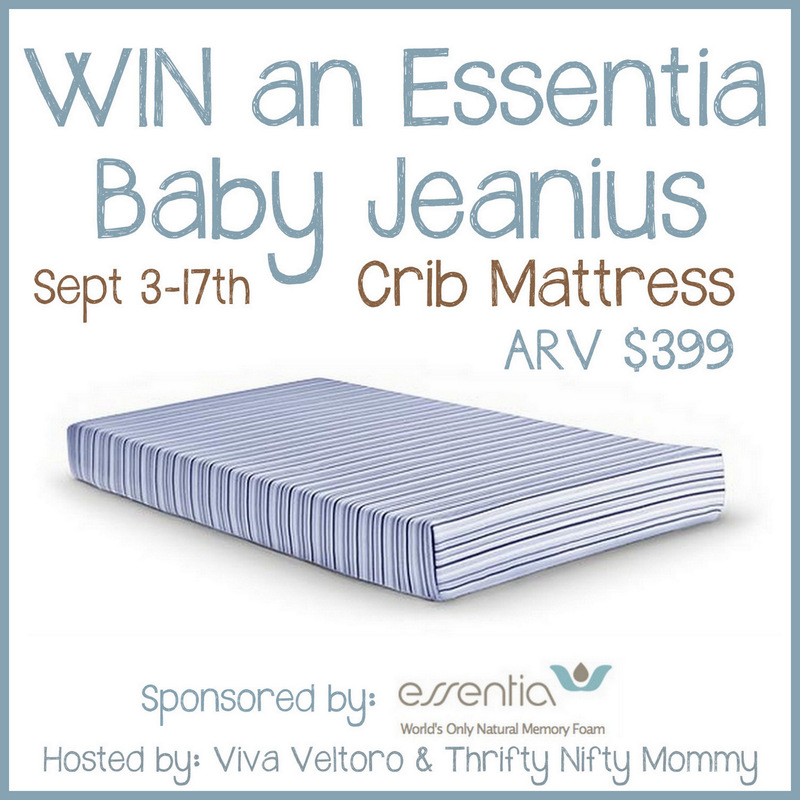 One lucky person will WIN a Baby Jeanius Crib Mattress valued at $399! Connect: You can connect with Essentia on their website and on Facebook, follow on Twitter & Pinterest. Buy It: Essentia products are available at many locations. Click here to find a retailer near you. 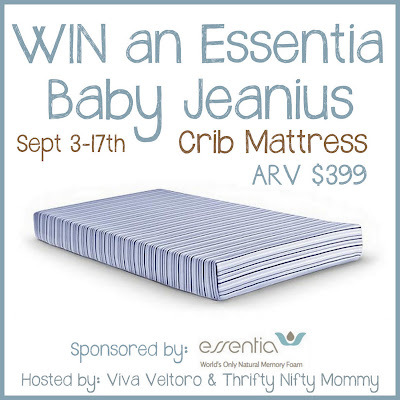 To WIN a Baby Jeanius Crib Mattess valued at $399, just enter using the Giveaway Tools form. Open to the US (48 Continental) & Canada (except for Nunavut, Northwest Territories and Yukon) only, ages 18 and up. Ends 9/17/13 at 11:59 PM EST.